BioShock gets too much credit, say Eidos Montreal's art director Jonathan Jacques-BelletÃªte. Jacques-BelletÃªte has struck out at claims that the studio has been copying ideas from Ubisoft and Irrational Games for Deus Ex: Human Revolution, saying that any similarities between it and Assassin's Creed 2 or BioShock were coincidental. Jacques-BelletÃªte thought that BioShock was given more credit for innovation than it strictly deserved. He said that while BioShock might have been some people's first experience with a narrative based shooter, it hadn't created the genre and that Irrational had built on the groundwork laid by other, older games. "BioShock's a funny game," he said. "Without taking anything away from it, it got a lot of credit for things a lot of games were doing waaay earlier. Even System Shock!" The Assassin's Creed 2 comparisons are based on Human Revolution's renaissance-inspired look, but Jacques-BelletÃªte is adamant that the former didn't inspire that latter. He said that work had started on Human Revolution long before Ubisoft got going on Assassin's Creed 2 and that when Eidos Montreal decided on Human Revolution's aesthetic, the rumors about AC2 were that it would be set in the Mayan era. "When I saw the first teaser later on I was like, 'argh,'" he said. "You can only take my word for it but we had no idea! I remember when word first came out I called some people and was like, 'wasn't it supposed to be f*cking Aztecs?'" It's not hard to see why Jacques-BelletÃªte is so frustrated. The comparisons between Human Revolution and BioShock must be annoying, but they at least make a certain amount of sense, if the people making them are unfamiliar with the original Deus Ex games. But to say Human Revolution is copying Assassin's Creed 2 because the games have a vaguely similar look in places is one heck of a stretch, and must be maddening for the artists involved. 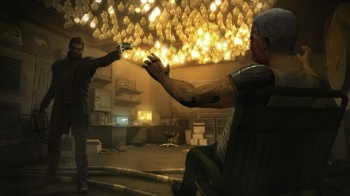 Deus Ex: Human Revolution comes out for PC, PS3 and Xbox 360 in February next year.